A business owner was in critical condition Tuesday morning after he was shot during a robbery at a convenience store in Long Beach, police said. 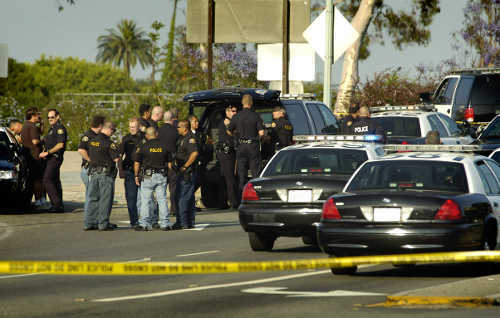 Officer responded to the area of East 7th Street and Cerritos Avenue after a report of a possible assault with a deadly weapon shortly before 8 p.m. Monday, according to Long Beach Police Department spokeswoman Marlene Arrona. When officers arrived, they determined that a robbery had occurred at a convenience store in the 1100 block of East 7th Street (map), Arrona said. Police blocked off the streets immediately, according to Nathan Deluca, the neighborhood’s watch captain. The man, who was identified by those who knew him as the store’s owner, was rushed to a hospital in critical condition after he was shot in the chest, according to police. Deluca knew the man and described him as a “friend of the neighborhood.” He said the man’s son also owned a business on the block. “They were always around and they were both very nice and caring to all of us in the neighborhood,” Deluca said. Rachel McClenton, who also knew the victim, said her son had just visited the store between 30 and 45 minutes before the man was shot. One man who frequented the store said the owner always sat in a chair and greeted customers when they came in. “What was the value of shooting him?” he asked. Deluca said he was surprised by the crime. “We haven’t had any crime like this for about a year,” Deluca said. The shooter or shooters remained at large, and an investigation was underway, according to Arrona. KTLA’s John A. Moreno, Tracy Bloom and Kareen Wynter contributed to this report.